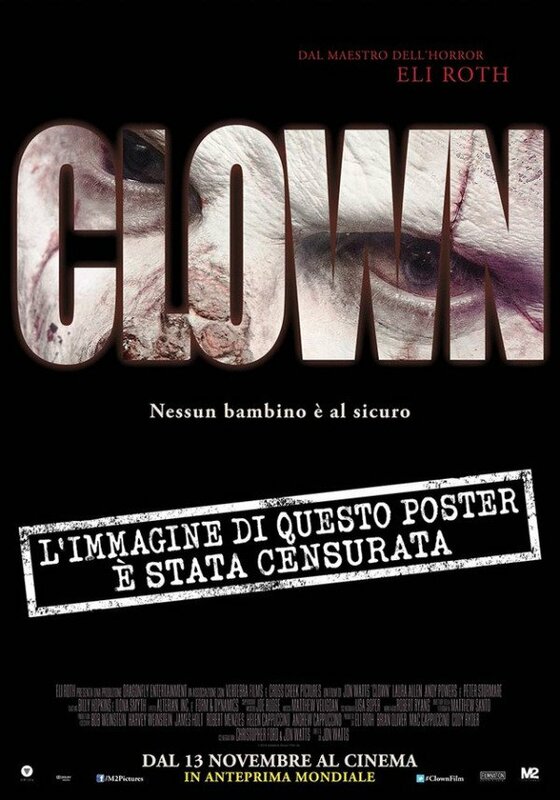 Warning: The following poster for the Eli Roth-produced horror movie Clown has been banned in Italy. Proceed with caution. Behold the ghoul at the center of Clown. He's a pretty grisly interpretation of the childhood party mainstay. Instead of brightly colored face paints, his makeup is made up of a mess of scars and blood. He exudes malevolence as the tagline translates to "No child is safe." But is he too scary to be seen in posters? Maybe. iHorror has called to our attention an Instagram post from the film's producer Eli Roth that shares the above poster with the caption "Banned in Italy! 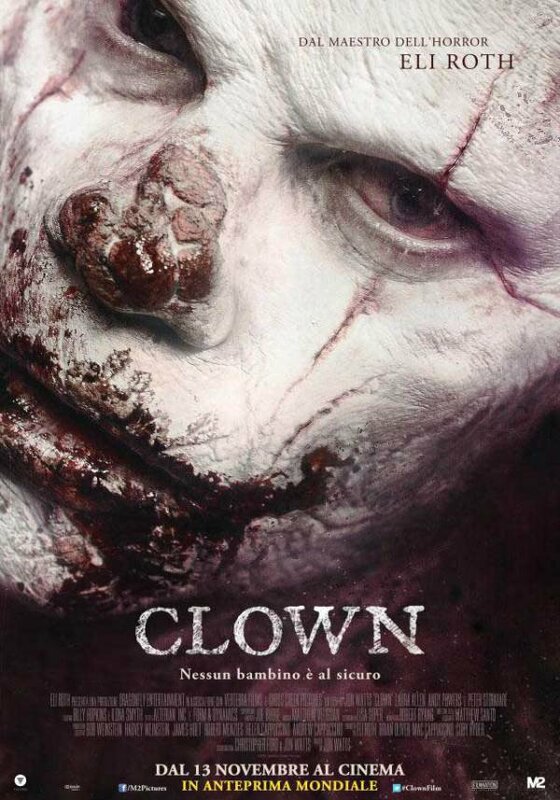 This poster for #Clown." Also shared by Roth in Instagram, this poster blocks out much of the creepy clown's features, but leaves enough remnants of that gnarled nose and facial scars to remain unnerving. As you might have gathered whether or not you're fluent in Italian, the additional poster text reads, "The image of this poster was censored." Eli Roth comments on the revised poster, "I think it's even creepier." Clown began as a movie trailer made by aspiring horror auteur Jon Watts. When Hostel director Eli Roth saw this cheeky bit of calling card, he got on board to help Watts spin his twisted trailer into a full on feature-length film. Watts penned the pic with Christopher D. Ford, and together they crafted a clown story unlike any we've heard before. This is not the tormented performer turned killer from American Horror Story: Freak Show. This is far weirder. The story centers on a loving father whose forced to scramble for a clown when the one he hired for his son's birthday bails. As fate would have it, he finds a costume and the party is saved! But when it comes time to take off the clown nose and wig, this dear old dad finds he can't get out of them without injury. And something inside of him begins to turn wicked. Clown opens November 13th in Italy. No U.S. release date has been announced. To see the full Clown trailer, click to page 2. You have to know... it is beyond disturbing. Clown - Trailer - Click here for another funny movie.